Photograph of Herman B Wells with Peruvian students taken by William Oglesby. March 3, 1959. Indiana University Archives, P0063511. We all are told many stories throughout our lives by family. Memories of the past told with the hope that a lesson will be taught or that the shared experience will bring about a closer bond. This is a story of how two journeys crossed paths. In 1935, Indiana University decided to establish the Audio-Visual Center (it would be later called Photographic Services) in an attempt to document the University’s history through visual media. The institution did this mainly through photography, and graduate students often assisted in fulfilling photo orders for various groups in and around campus. In 2000, the photographic negatives that were created as a result of this work were transferred to the Indiana University Archives and added to the photograph collections. 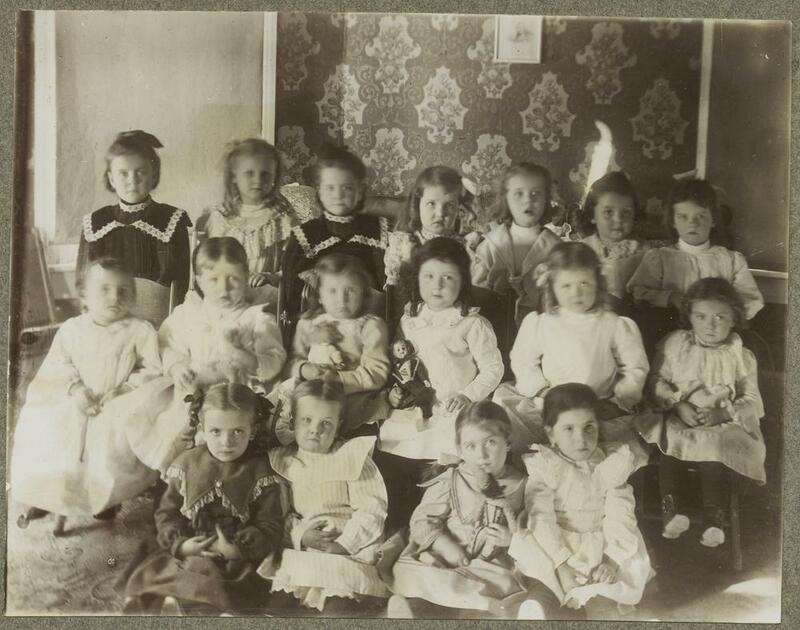 The thousands of images are presently being digitized and uploaded online in the Archives Photograph Collection. The story begins with William B. Oglesby, a graduate student at Indiana University from 1958-1961, who worked for Photographic Services as a photographer. He took hundreds of photographs covering a wide variety of topics during his time there. He told me stories about his experiences, such as the quote with which this post opens. I suppose this is the part where I should mention he also happens to be my grandfather. William Oglesby at the Photolab Christmas Party. December 19, 1958. Indiana University Archives, P0063320. My part in the story actually starts with these talks I had with my grandfather. It was early 2016, and I had just informed him that I would be heading to Indiana University to pursue my MLS. I knew vaguely that he had gone to IU for his Masters in Audio-Visual Studies, but I never inquired deeply about it and it had never come up in conversation. Later that fall when I told him I was working in the Indiana University Archives with the photograph collection, he casually mentioned he had shot some photographs for Indiana University (not mentioning in what capacity) and that if I had time I might see if the Archives had any. His expectations were low, but I looked into it. Bill Oglesby employee card. Indiana University Archives. As you can probably guess, I found them…a lot of them, over 1400 images in fact. 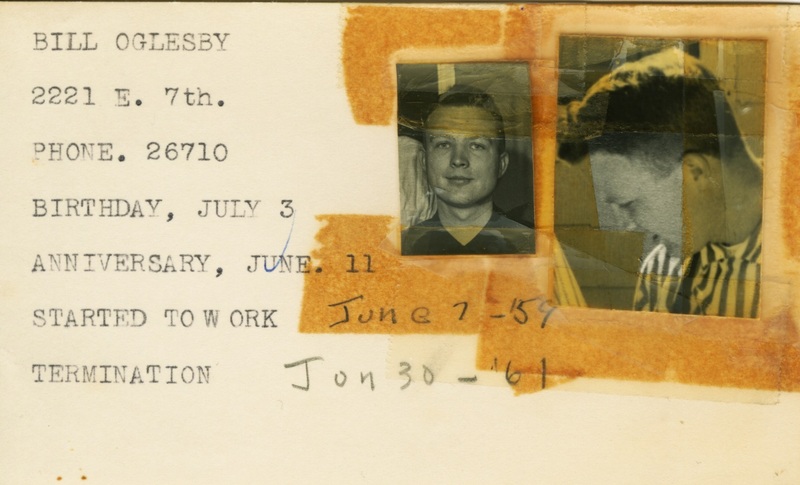 It started with my supervisor showing me the employee cards of people who worked in Photographic Services and from there it was a matter of just going through the correct dates in the collection and finding all the image envelopes that had “Oglesby” written on it. I scanned all those images and by Fall 2017, all of the images were available for viewing online in the Archives Photograph Collection. It was about this time it was suggested to me that I conduct an oral history with my grandfather as part of Indiana University Bicentennial Oral History Project. I accepted and interviewed him in January 2018, where I learned all about his time at IU and the stories behind the photographs I had just digitized. It was this interview that inspired me to tell his story, and I happened to be planning an exhibition at the time. I took the opportunity to curate an exhibition using my grandfather’s photographs and implementing quotes from his oral history for context. I find that photographs have the unique ability to document moments in time and capture emotion, since they are both a historical object and a form of art. When paired with oral history, the tale behind each image provides new perspective and greater appreciation for that captured moment. “Through the Lens: Documenting Indiana University Bloomington Photographically,” is an exhibition that takes these concepts and puts them into practice. Photograph of the Marching Hundred by William Oglesby. October 15, 1960. Indiana University Archives, P0071516. To discover what it was like to work for Photographic Services from a student perspective and what was going on at IU during this time, please visit “Through the Lens: Documenting Indiana University Bloomington photographically,” in person before Monday, July 9th, 2018! As springtime bloomed across Indiana University in 1908, an Indiana Daily Student reporter eagerly previewed an upcoming campus event. “Dainty maids in the picturesque garb of the English peasant or the flaxen-haired Norwegian will dance the complex, but graceful folk dances of long ago.” Who were these “dainty maids” and what was this dazzling-sounding spectacle? 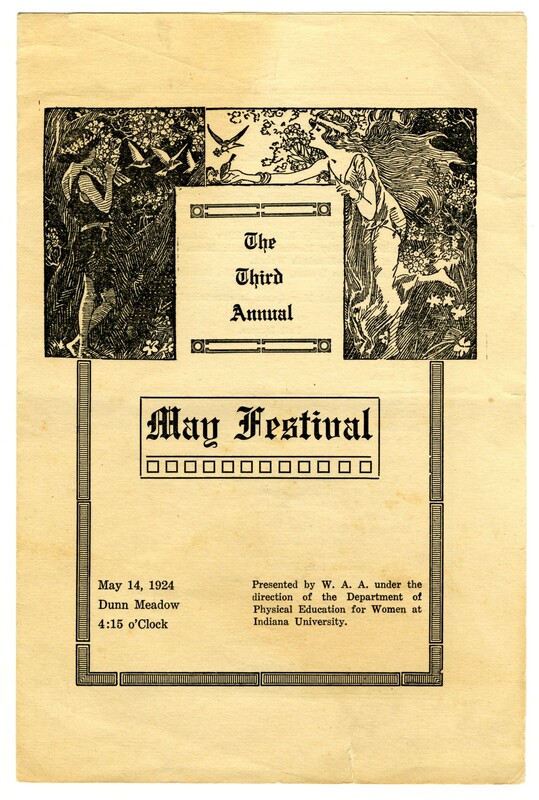 The new Indiana University May Festival collection (C693) at the University Archives tells us a history of a vernal campus tradition. Importantly, the Indiana University May Festival became an active space for female student participation in the early twentieth century. The IU May Festival began in earnest in 1905, when the IU Lecture Association organized an event featuring orchestral and choral performances in the Men’s Gymnasium. A cantata rendition of “The Swan and the Skylark” and ballet music from Faust evoked a springtime feeling. Despite glowing reviews, the IULA-hosted May Festival suffered from poor student participation. An Indiana Daily Student reporter expressed disappointment in 1906: “The small attendance is inconceivable. If the singers of Bloomington and the University knew what the chorus is doing, there would be a regular attendance of 200 instead of 30 or 40.” The event satisfied a Bloomington audience, but didn’t impact enough IU students at the time. Beginning in 1908, the Women’s Athletic Association and Department of Physical Education for Women hosted the event in the Women’s Gymnasium for an invitation-only audience. Female students demonstrated exercises like dumbbell handling and club-swinging “with all the vigor and skill of their brothers,” as an IDS reporter noted. In the afternoon, they transformed into “dainty maids” to dance and wind cream and crimson streamers around a tall May Pole. Interestingly, the IDS also notes that only a small number of male students received invitations to the 1908 event. 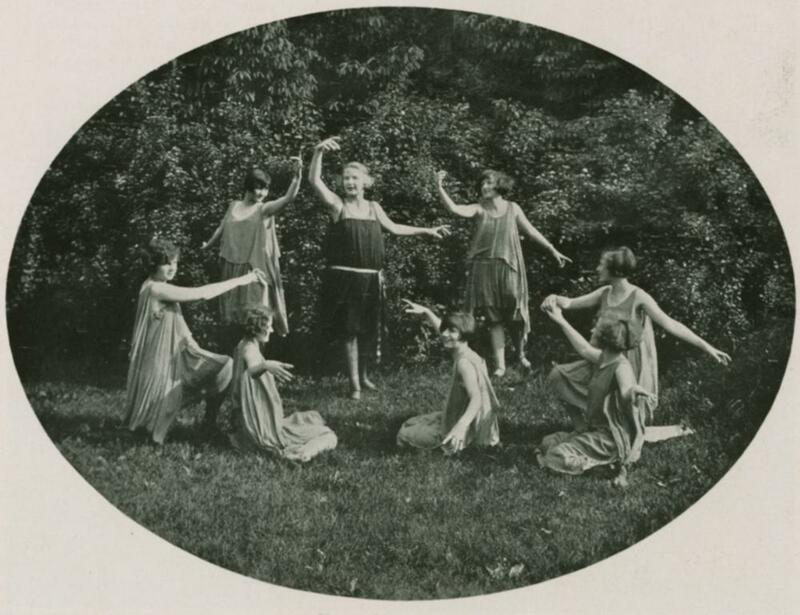 This iteration of the May Festival was a staple of campus life by the 1920s. By 1922, the Women’s Self-Government Association (WSGA) sponsored an integral feature of the event: the election and crowning of a May Queen. The 1924 May Festival program names Mildred Wight as May Queen, with her heralds Ethel Budrow and Dorothy Tousley. Following a procession with flower girls, crown bearers, maids of honor, and other attendants, “The newly crowned May Queen is entertained by the joyous peasants.” IU students in pastoral garb performed six folk dances for the May Queen, followed by the mythical dance program “Fantasy of Dusk and Dawn.” The programs in this collection show how the all-female May Festival committee staged a mythological renaissance for modern day Bloomington. By the 1922 May Festival, the WAA and WSGA had moved proceedings to Dunn Meadow. Rather than an invitation-only event in the Women’s Gymnasium, the May Festival had turned into a public performance. This collection also includes a 25-cent ticket for “Sylvia” to attend the Dance Drama portion of the festival at Dunn Meadow in 1927. IDS articles from this time also list the delightful box lunches served to attendees (who could say no to shrimp and mayonnaise sandwiches?) at no cost. One reporter indicated that the WAA and WSGA prepared 800 of these lunches—enough for a huge crowd. The May Festival shows how women at IU transformed a small musical celebration into a popular event that highlighted their talents as athletes, dancers, singers, and artists. It appears that the WAA and WSGA ceased sponsorship of the May Festival after the 1920s. 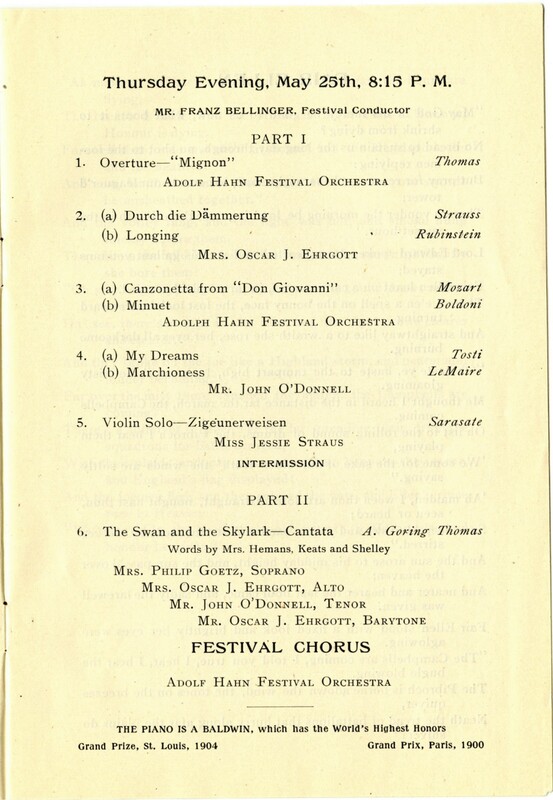 The last program contained in this collection is from 1928. 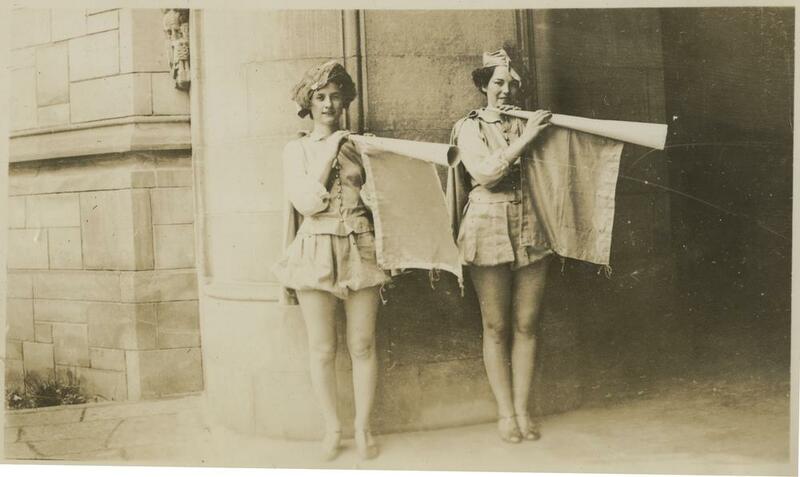 IU women, however, carried on celebrating the tradition into at least the 1940s, as documented in the IU women’s residence halls scrapbooks. Collection C631, which contains 82 such scrapbooks from 1925-1959, is open for research and offers images from these later unofficial celebrations. To learn more about the May Festival collection or to view the collection yourself, please feel free to contact the University Archives to set up an appointment. While browsing an antique shop near Hanover, New Hampshire, a 1956 graduate of Indiana University came upon the photograph seen here. Recognizing the address found on the back of the image she purchased the image and donated it to the Indiana University Archives. (Back Row, L to R) Mary Woodburn, Doris Hoffman, Martha Woodburn, Marjorie Davis, Dorothy Cunningham, Mary Louden, and Agnes Joyner. (Middle Row, L to R) Elizabeth Miller, Martha Buskirk, Ruth Dill, Carol Hoffman, Frieda Hershey, and Ruth Cravens. (Front Row, L to R) Margaret Faris, Pauline Reed, Dorothy Clough and Catherine Fletcher. For a curator of photographs there is no image more appealing than one with a great deal of contextual information (e.g. names and date) and this image certainly fits into that category as the back side of the photograph gives us not only the names of those shown and the date taken, but also the event, the exact location of the event and even the name of the photographer. On top of that, a transcription of the original invitation is also present. The birthday girl was born on February 12, 1898 (her mother died eight days later). Ruth was graduated from IU in 1920 with a degree in English. From 1942-1956 she worked as an administrative assistant to IU President Herman B Wells. Ruth never married. She died January 20, 1982. Ruth’s stepmother, Emma Lucille Krueger Cravens, worked in the IU Library and then as a secretary for IU President William Lowe Bryan. Ruth’s father, John W. Cravens, graduated from IU in 1897. For many years he served as IU Registrar and Secretary to the IU Board of Trustees. The photographer, John A. Stoneking, was graduated from Indiana University in 1898 with a degree in physics, he subsequently received his master’s degree from Indiana University in 1901 and from 1901-1905 he was an instructor in physics here before moving to Illinois where he died in 1923. Others in the photograph known to have graduated from Indiana University are Mary Louden (AB 1919) and Frieda Hershey (AB 1921). In 1953, Malcolm “Mac” Fleming joined the Indiana University School of Education and the Audio-Visual Center of Adult Education, where he began as an instructor and acting supervisor of motion pictures. What students may not have known is that their young instructor had been taught the trade by Uncle Sam. In the belt pouch meant for a first aid kit, Mac instead carried his own small camera so that in addition to the official Army photos, he could capture shots of scenes that were of personal interest. In a field notebook, he documented these images just as he did the Army photos and films, and what resulted was a rich record of one young soldier’s experience in the European Theater. The destruction, the refugees carrying what possessions they could, and village life that went on as it could were all captured by Fleming’s little camera. Fleming’s caption typed on reverse side of image reads, in full: “Ruins now lie at the feet of the iron figure of Kaiser Wilhelm. A German living in a nearby room amid the rubble showed me this viewpoint. Looking at it while I took the pic he said that Hitler had gotten what he’d been pleading for–total war.” July 9, 1945, Nuremberg, Germany. 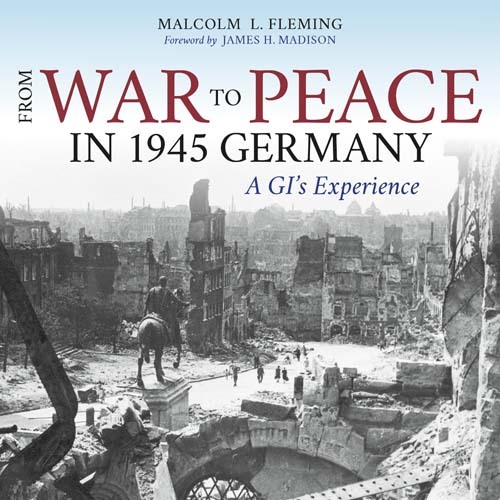 Now in his 90s, Prof. Fleming has donated his extensive collection to the University Archives, but not before collaborating with the IU Press in a gorgeous book, “From War to Peace in 1945 Germany: A GI’s Experience.” The book which includes his original notes, partnered with updated captions and a foreword by James H. Madison, IU’s Thomas and Kathryn Miller Professor Emeritus of History, and an afterword by Brad Cook, Curator of Photographs here in the Archives, is a must have for anybody with an interest in World War II. Indiana University’s Contemporary Dance Program dates back to 1927. Dancer Jane Fox, a graduate of Columbia University (NY), came to the IU campus as a faculty member with the intention of introducing “natural dance” to students. Though we know it to be its own department today, the Program first began as a part of the Women’s Physical Education department, under the supervision of the School of Education, which supported and funded it. Classes were held in the Student Building and in 1935, the first modern dance performing group, the Terpsichoreans, was organized. This group later evolved into the Modern Dance Workshop. Jane Fox was not only a staunch defender of dance education but also worked to validate the art of dance to the campus in general. In her quest to gain a wide acceptance of modern dance as a legitimate art form and academic discipline, Fox garnered campus, community, and national support. She immersed herself not only into IU’s culture, but also became the Chair and Secretary of the Dance Section of the American Association for Health, Physical Education and Recreation (AAHPER), the head of the National Committee on Standards in Teacher Education in Dance, and frequently contributed scholarly writings to the Journal of AAHPER and The Dance Observer. Fox continued to defend the validity of the art form during her time at Indiana University, and soon the medium was well respected on campus. In 1949, the Dance Major Program was formed, and with continued support from Fox, as well as increased student enrollment, modern dance was soon seen as a legitimate part of the campus community and a respected academic discipline. The Dance Major Program experienced tremendous growth in both enrollment and reputation from this time until the late 1980s, and had a successive number of coordinators to direct the Program including Dr. Jacqueline Clifford, Fran Snygg, Bill Evans, Vera Orlock, Gwen Hamm, and Dr. John Shea. Despite their best efforts to keep students enrolled during 1988-1991, the School of Health, Physical Education and Recreation administration decided that a moratorium would be placed on the Dance program, effective May 1991. Students would be allowed to complete their Bachelor’s degrees in dance, but no new students would be accepted into the Dance Major Program. Despite this massive change, the professors and staff members committed to the role and mission of the program spent the next ten years (1991-2001) attempting to salvage the work they, Fox, and others had put forth during the last 60 years. 1991-2001 saw an increase in the number of students enrolled in the Elective Dance Program, which gave them hope for the future. Courses were expanded, students were surveyed, and the administration began to discuss the possibility of reinstating the Dance Major in 2004. Once all of the reinstatement procedures were determined and the curriculum revision had taken place, the fall of 2005 saw the first audition and admission of students to the Dance Major since 1991.
also study ballet and world dance forms, and can elect to study musical theatre, tap, and jazz. The Program boasts over 50 Dance Majors and 100 Dance Minors. To learn more visit the IU Contemporary Dance Program’s website, or visit the IU Archives to view the Jane Fox papers or the Dance Program records.